Today, our children’s study habits face two distinct challenges. The first is the digital era, which provides a massive source of distraction for them at every turn. The second is a growing body of extracurricular activities – which, while certainly a good thing, makes it harder than ever to develop studying skills. Here are some tips you can use to help promote efficient studying habits in your child. By having a fixed time of the day devoted entirely to schoolwork and study, your child will be able to efficiently address their schooling needs. It also helps them build time management habits that they’ll carry out on their own. Eventually, they’ll be able to take ownership of their study habits and develop a healthy sense of agency in their life. Working in a comfortable bedroom associated with leisure and sleep can be difficult. By providing them with a dedicated study area, you can help them get in the studying mindset, free from distractions or the temptation to slack off. The goal is for your child to develop their own habits, not just get better a doing what you say. Allow your child room to grow and make their own decisions, provide them with options rather than dictate how they should study. It of course goes without saying that you shouldn’t be doing their homework for them, too. Studying for hours on end without a break will burn out any child. Giving them the freedom to take breaks and enjoy themselves will ensure that what they’re studying is actually entering their head. Critical and analytical thinking skills are incredibly important for your child, as the world is increasing shifting towards tasks and jobs that require it. Indeed, we’ve previously taken note of how critical thinking is important to your child’s future. 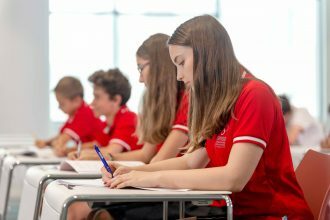 At Swiss International School in Dubai, we use the International Baccalaureate curriculum, which promotes critical understanding over textbook memorization. Studying today therefore is quite a different challenge for children at IB schools. You can help put your child’s study habits in the right direction by asking them questions about their homework that forces them to confront ideas, rather than just parrot facts and figures. You can also encourage them to question what they know, in a way that reinforces their knowledge because they become able to understand it better.